Pomegranate lovers, here's a treat for you. I love pomegranate and I can take it in any form. Even in the form of a chutney. This fruit is a great addition to salads and also it can make Kashmiri pulao more colourful. 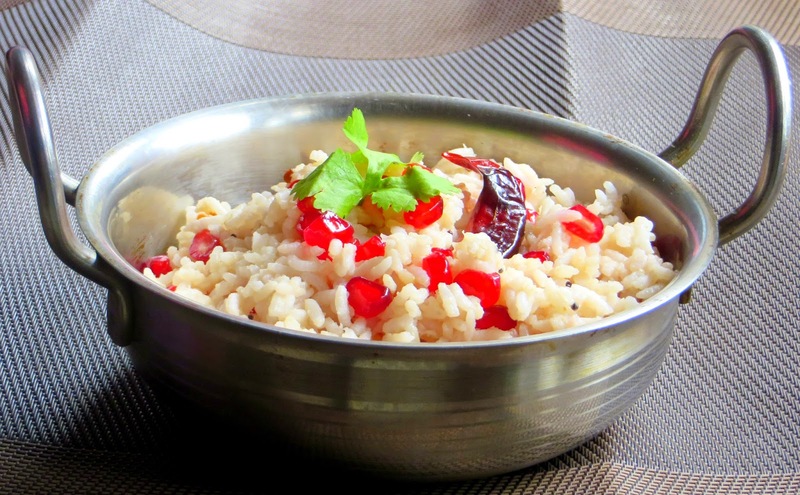 This is a very simple rice recipe made with the pomegranate juice extract. This recipe is almost similar to Lemon rice, Apart from being a healthy alternative to tamarind rice and other chitra anna, its also a great addition to the menu when you have guest. Its so colourful and unique. Here is the recipe. Cut the pomegranate into two halves. Take out the seeds. You can google to find many ways to take the seeds out effortless. Grind half the seeds and strain using a filter. Keep the extract aside. Heat oil in a kadai and temper the mustard seeds. Then add curry leaves if using. Add the chilli you want to use (red or green or combination). Add the juice extract and salt as required. Mix in rice. Use a fork to mix so you don't break the rice. Mix in the remaining seeds and garnish with coriander leaves. Its a great lunch box recipe too. A must try recipe for those fruit lovers who want to taste the fruit in different avatars. I will definitely try this out and my younger brother will love it.